To paraphrase the closing line of Act III of William Congreve's The Mourning Bride, "Hell hath no fury like a woman scorned." 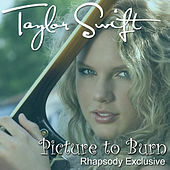 After listening to Taylor Swift's biting "Picture to Burn," it might be safe (if not grammatically incorrect) to say that Nashville hath the fury of a woman scorned. In other words, don't double-cross Miss Swift or her vengeance will materialize in the form of a really catchy country pop song where she insults your pick-up truck, tells everyone that you are gay, gets with your bros out of spite and cuts you down smaller than Alanis Morissette's "You Oughta Know."